Forty-five student works are on display in the visual arts center until Feb. 6, 2019. An exhibition filled with art students’ artwork opened to the public Nov.15, in the visual arts center. The works will be at the center until Feb. 6, 2019. The center is open 6:30 a.m.-7:30 p.m. and the gallery is open 8 a.m.-5 p.m. for students to view the pieces. The paintings were created by students enrolled in Arts 2316, Painting 1; Arts 2317, Painting 2; and Arts 1325, Drawing and Painting. The exhibit was juried by visual arts Professor Eduardo Rodriguez and visual arts Adjunct Alfonso Cantu. The jury started with about 100 pieces of art and whittled the selection to 45 pieces. The paintings are installed on both floors of the main gallery. Visual arts Adjunct Roberta Buckles teaches non-art majors and said she is proud of her students and the hard work they’ve done. “My students are dedicated and were willing to step out of their comfort zones to take risks and reap the reward. Sometimes, it didn’t turn out the way they expected, but without going there, they couldn’t have gotten to where they are now,” Buckles said in an interview Nov. 9. Art can carry multiple meanings for Art Guild President Albert Gonzales, fine arts freshman. 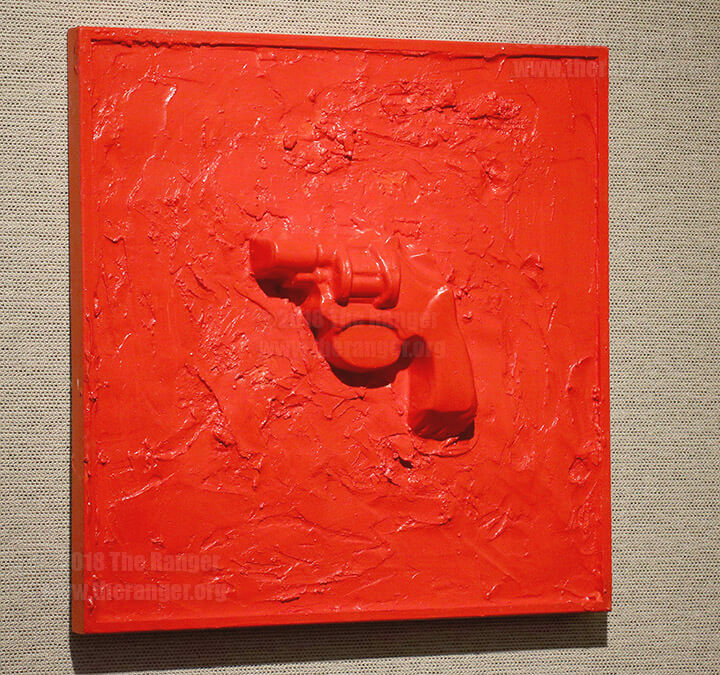 His piece “Red,” a toy gun cast in red acrylic paint, in A 10-by-10-inch wood panel frame, can evoke multiple meanings, such as warning, violence, and concern for viewers, Gonzales said. Gonzales wanted to go on a minimalistic view with the piece, focusing on the toy gun, which from afar looks like an accurate firearm cast in red, Gonzales said in an interview Nov. 14. Growing up, Gonzales said his mother wouldn’t allow him to own a toy gun. “I wanted the viewer to focus on the color red and the piece. The color red can mean many different things. By using one solid color, the piece becomes bolder and has more meaning than it would have with multiple colors,” Gonzales said. “With the toy gun being the subject, it’s open to different opinions and views. For me, it represents never growing up and being allowed to play with a toy gun,” Gonzales said. For more information, call Rodriguez at 210-557-5383.